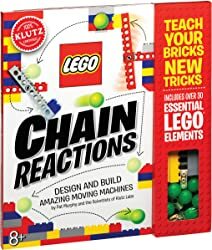 LEGO Chain Reactions is packed full of ideas, instructions, and inspiration for 10 LEGO machines that spin, swing, pivot, roll, lift, and drop. Each machine alone is awesome, but put them together and you get incredible chain reactions. Then, combine the machines in any order you like to create your own chain reactions. The kit comes with 78 page book of detailed instructions with brightly colored images, you will learn to build machines ranging in complexity from easy to advance, 33 special LEGO elements that combine with basic bricks from your collection to make your machines go, 6 LEGO ball, string, paper ramps and other components. Recommended for children ages 8 and older. Design and build 10 amazing moving machines! Comes with 78 page instructions, 33 LEGO pieces, instructions for 10 modules, 6 plastic balls, string, paper ramps and other components.